Visit the Table of Contents to read individual articles. Who lives in rural Minnesota? When the editorial committee settled on this for a theme this year, the answer seemed obvious. But as soon as the discussion even began to scratch the surface, the reality became more and more complicated. 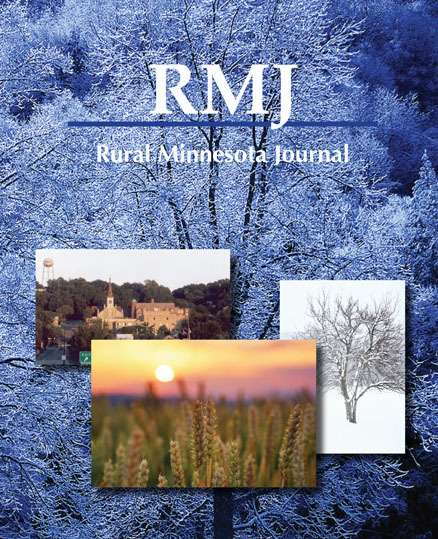 The truth of the matter, the committee decided, is that the answer to who lives in rural Minnesota depends on where you are, and wherever you are, rural Minnesota is a region in transition. So focus this year is on transition. Who lives in rural Minnesota? At first glance, rural Minnesota’s population still looks a lot like it did ten, twenty years ago. But actually, the population is older than it was ten years ago—on average. It depends where you are. In some counties, the average age is quite a bit older. In some cities it’s getting younger. And the population is less white than ten years ago—again, depending on where you are. Some towns look much the same as they have for the last one hundred years. Yet that’s the exception more than the rule these days, as most rural communities have at least a small minority population, while in some towns more than half the school population is made up of minorities. The way local government is funded has changed drastically to the point that no services can be taken for granted anymore. And the economy itself has changed to the point where rural schools must figure out how to prepare children for careers that don’t even exist yet, while community leaders work out how to create those jobs. The question is: Are Minnesota’s decision makers ready to create policy today for a population that is going to look much different tomorrow? In this issue, we take a look at a set of issues that rise out of this question. From volunteerism to community leadership to welcoming new residents, this year’s authors are addressing some important themes. To introduce this issue, we’ve asked a member of the RMJ editorial committee, Bob Franklin, to write a piece on why everyone in Minnesota should care about what happens in rural Minnesota. There’s the economy, yes, but there are a lot of other reasons why Minnesota needs to function as one state. The ever-reliable Ben Winchester slices and dices the 2010 Census data to take a look at not just who is living in Minnesota right now, but how the population has changed over the last twenty years and what trends are emerging going into the future. Volunteers are the lifeblood of every rural community—they get things done. Yet those who depend on volunteers know this is another area that is in great flux. Mary Quirk, executive director of the Minnesota Association of Volunteer Administrators, discusses the changes happening as the volunteer workforce transitions from the Greatest Generation through the Baby Boomers to Generation X and beyond. What makes each group tick? The aging of the Baby Boom generation may be the biggest demographic shift Minnesota and the United States have ever seen. As they hit their senior years, they also have tastes in living choices that are quite different from those of their parents. LaRhae Knatterud of the Minnesota Department of Human Services asks whether Minnesota communities will be prepared to accommodate their needs and wants? Quality of leadership is also a growing question for communities whose populations are shrinking as well as for those that are increasing. Two articles discuss examples of two different leadership programs. The Blandin Foundation’s longstanding leadership program relies on not just building leadership skills in the individuals, but also showing these individuals how to build the networks and relationships needed as communities face new challenges. A problem in many rural communities is just finding people willing to fill leadership roles. In west central Minnesota, University of Minnesota Extension researchers found that there are many willing folks. They just needed to be asked. Who lives in our rural communities is changing, and so too are the ways these communities support themselves. As tax dollars shrink, the philanthropic community is finding itself being asked to play a bigger role. The heart of Greater Minnesota is its workforce, and like everything else, the workforce here is changing. But so, too, are the jobs themselves. Kyle Uphoff of the Minnesota Department of Employment and Economic Development looks at two important factors: the trend in skills that will be needed for tomorrow’s jobs and the supply of workers who are ready. A region in transition? The city of Pelican Rapids in west central Minnesota is a microcosm of the change the state is going through as a whole. Joan Ellison, one person who watched it all happen, tells how the city rose to the challenge and embraced change. So as you read these articles, please think not just about how different things are now from what they used to be, but how different things are going from what they are now.